Olympus has announced the new M.ZUIKO Digital ED 300mm f/4.0 IS PRO Lens, a new long focal length lens for four thirds system cameras giving users a Professional Quality lens with a bright f/4 aperture at 300mm, a focal length equivalent to 600mm on a 35mm camera model. This new lens model is equipped with built in optical image stabilization to help reduce blur from camera shake, with a design that lets it work in harmony with in-camera stabilization on models like the OM-D E-M1. This new lens also sports superb build quality including a dust and moisture resistant design for use in harsher shooting environments, with a compact size and lower weight compared to an 600mm lenses designed for 35mm camera models to get the same angle of view. 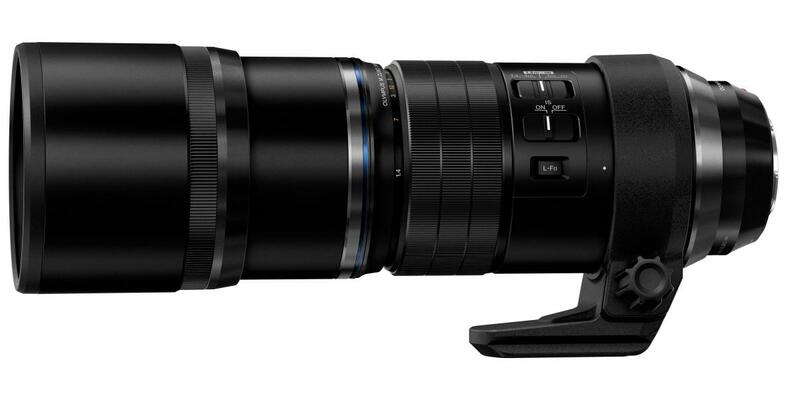 For example, this new M.ZUIKO lens has a length of only 8.9 inches (227mm), weighing in at only 2.8 pounds (1,270 grams). Olympus included three Super ED lenses, one Extra-High Refractive index lens and three High Refractive index lenses to reduce color bleeding and chromatic aberrations, and also coating the lens elements using technology they're referring to as ZERO (ZUIKO Extra-low Reflective Optical Coating) to minimize ghosts and flaring. This new lens also includes a Silent Mode for fast and quiet Autofocus for recording video or still images, with a clutch mechanism that allows a user to switch to manual focus instantly when needed by pulling the focusing ring. It also features a focus limit switch that can limit focus adjustments to specific distance ranges to speed up autofocus times, and has a built-in sliding lens hood. This lens also sports a dedicated IS switch. The M.ZUIKO Digital ED 300mm f4.0 IS PRO lens is available now for an estimated street price of $2,499.99 (U.S.) and $3,199.99 (Canada). CENTER VALLEY, Pa., January 5, 2016 --Olympus is pleased to announce the Olympus M.ZUIKO Digital ED 300mm f4.0 IS PRO, a compact super-telephoto lens that expands the capability of the M.Zuiko PRO series of professional, splashproof and dustproof lenses that deliver outstanding image quality in any circumstance. The M.ZUIKO Digital ED 300mm f4.0 IS PRO is the first Olympus interchangeable lens with a built-in image stabilization mechanism, and when paired with the Olympus OM-D E-M1 (firmware version 4.0) or E-M5 Mark II (firmware version 2.0), in-body and in-lens image stabilization work in perfect harmony resulting in the new 5-Axis Sync IS technology to produce the world's most powerful image stabilization performance of up to six shutter speed steps of compensation*. The lens can also be used effectively with other camera bodies, as the in-lens stabilization mechanism alone provides 4 shutter speeds steps of compensation. With a length of 8.9 inches (227mm) and weight of a mere 2.8 pounds (1,270g), one third of the size and weight of most DSLR 600mm equivalents, the M.ZUIKO Digital ED 300mm f4.0 IS PRO is designed to slip into an airplane carry-on bag or backpack and go anywhere to help users easily capture handheld images from once-challenging photo destinations. Despite the compact size, the lens features hermetic sealing in 17 places and freezeproof performance down to 14⁰F (-10°C). When combined with the same splashproof, dustproof and freezeproof characteristics of the OM-D E-M1 and E-M5 Mark II, you can capture high-quality images in the harshest environments. The M.ZUIKO Digital ED 300mm f4.0 IS PRO debuts Olympus' highest ever resolution by combining three Super ED lenses, one Extra-High Refractive index lens and three High Refractive index lenses to reduce color bleeding and chromatic aberrations that tend to occur on typical super-telephoto lenses. In addition to Olympus' renowned ZERO Coating (Zuiko Extra Low Reflective Optical Coating), a brand new lens coating technology called Zero Coating Nano suppresses reflected light to minimize ghosts and flares for extremely sharp details of images including car headlights. A layer of nano-sized particles and a layer of air in the center to the surface of the lens achieves a refractive index similar to air and significantly reduces surface reflection. The M.ZUIKO Digital ED 300mm f4.0 IS PRO also gets up close to explore the beautiful, minute world of telemacro photography with maximum image magnification of 0.48x (35mm equivalent), with a minimum focusing distance of 46 inches (1.15m) from the end of the lens. When combined with the M.ZUIKO Digital 1.4X TELECONVERER MC-14, the user can capture all of nature's beauty in high resolution at 840mm (35mm equivalent) and an increased image magnification of 0.67x (35mm equivalent), while maintaining the same minimum focus distance, in a handheld, compact body. The OM-D's silent mode combines with the lens' Movie & Still Compatible mechanism for silent AF and shooting, giving the user an ability to blend into the background of any situation whether that be the refinement of a symphony performance or the dusty plains of a lion's hunting grounds. The lens also features a Manual Focus Clutch mechanism that makes switching to manual focus possible by pulling the focusing ring toward you. The side of the lens barrel features a Focus Limit switch (4m to infinity, all range, 1.4 to 4m), an IS switch (On/Off), and an L-Fn button which can all be operated without ever taking your eye off the viewfinder. The built-in sliding lens hood can be locked into place when extended, and a removable tripod base plate on the bottom with a quick shoe compatible rail. The M.ZUIKO Digital ED 300mm f4.0 IS PRO lens is available now for an estimated street price of $2,499.99 (U.S.) and $3,299.99 (Canada). To find out more about the Olympus M.ZUIKO Digital ED 300mm f4.0 IS and for a complete list of specifications, visit the Olympus website at www.olympusamerica.com. *As of December 2015. CIPA guideline compliant, when correction is carried out on two axes (yaw and pitch). When halfway release image stabilization is off. Copyright © 2015 Olympus America Inc.